Having seen and understood the basics of List Reports and the main annotations, you are ready to explore other UI annotations. You might want to start with some simple changes – sorting and grouping. Certainly your users can sort and group a list report using the settings icon. However if you are creating a custom report you will probably want to default the sorting and grouping for them. In this blog you will see how to set the default sort order and grouping as a developer. It’s worth remembering that, as well as guiding the design of the List Report through annotations, there are always some List Report behaviours end users can control for themselves. Naturally, if there’s a common preference among many end users you will want to default those behaviours up front using annotations. It’s also necessary to set certain default behaviours – such as sorting and grouping – if you want to add more advanced aggregation features such as totals, subtotals, and other analytics. As a developer you can also adjust the Sort Order and Grouping using the annotation UI.PresentationVariant. Using annotations to default the Sort Order is straightforward. Setting up a default Grouping, however, requires you to have a little more knowledge than just the annotations. 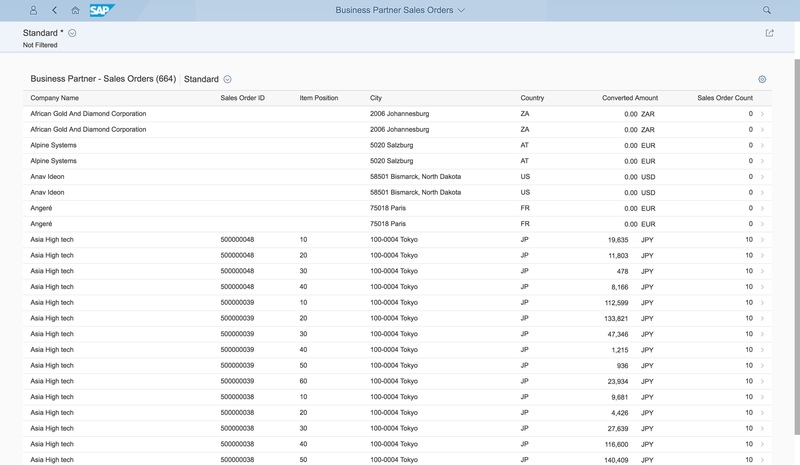 You will need to understand the difference between the different table types supported by the Fiori element List Report, and how that impacts grouping and other table behaviours. IMPORTANT: For simplicity in this blog you will see firstly how to default sorting and grouping using local annotations. However remember that if you are creating a specific custom CDS View to provide the data for your List Report you are recommended to build the annotations into the CDS View using a Metadata Extension. 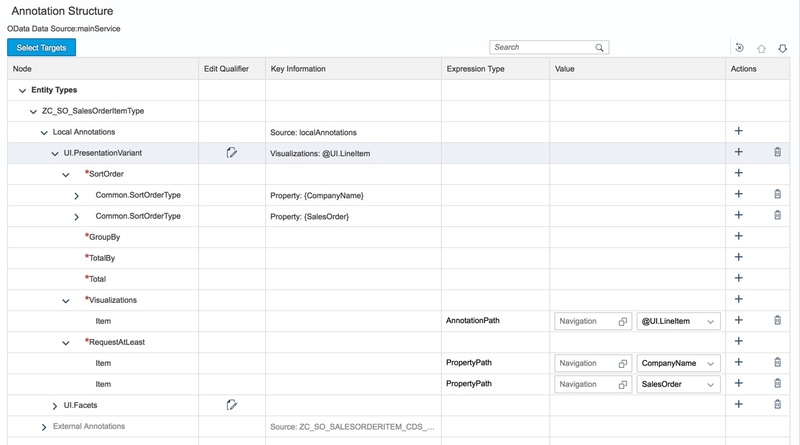 You can find out more about Metadata Extensions in the ABAP Programming Model for SAP Fiori. Below you see a simple Sales Order list report. This is your starting point for the rest of the examples in this blog. 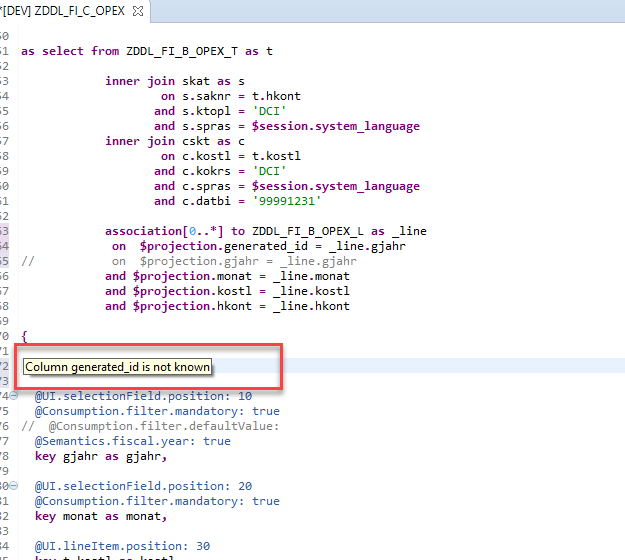 TIP: This report is based on a ABAP CDS View exposed as an OData Service, as recommended in the ABAP Programming Model for SAP Fiori. The Responsive type is a simple lean table. This table type is recommended for use on all types of devices including smartphones. 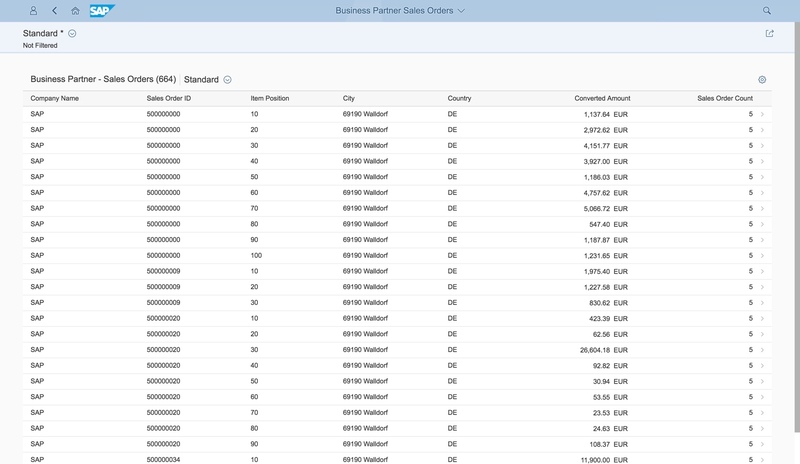 With a responsive table you can Sort and add a single level of Grouping as a business user, using the Settings icon. However you are not permitted to default this as a developer. This example shows single level grouping on the Company Name. The other table types are known collectively as Analytical table types. They are intended to handle larger amounts of data, and are therefore recommended for larger devices, e.g. desktop and tablet. With analytical tables you can Sort and do multiple levels of Grouping, both as a business user and as a developer. TIP: In the latest versions you even get a Show Details link for a totals dialog summarizing a column of amounts in multiple currencies into a consolidated total into a total per currency. A Grid table is the default table type used when your OData Service includes aggregated data, i.e. attribute sap:semantics is set to “aggregate”. TIP: You can see this setting on the Entity Type tag in the metadata of your OData Service, e.g. Aggregated data can be shown with summary information such as totals. TIP: You cannot use DefaultAggregation annotations in metadata extensions. You can find out more about Default Aggregations in the ABAP Programming Model for SAP Fiori. A Tree table is used to show lists with hierarchical tree structures. 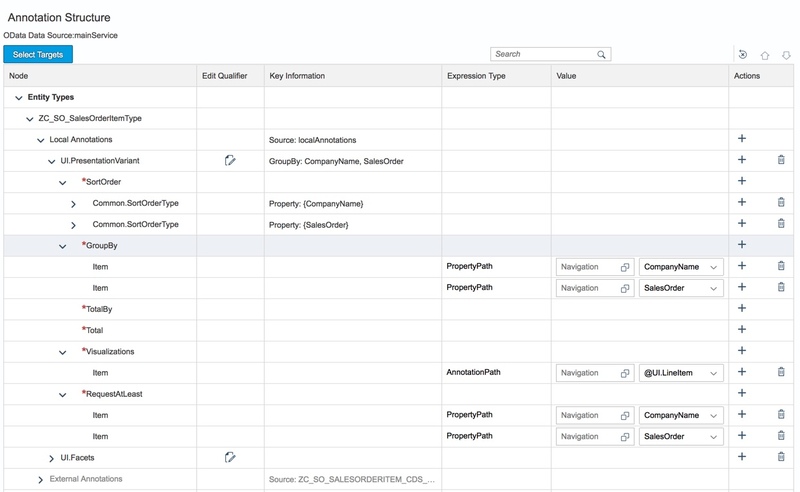 When you add grouping properties to a Grid table, the Fiori elements automatically converts to a Tree table. This has the added bonus that as you adjust the grouping, totals and subtotals can be shown as well. 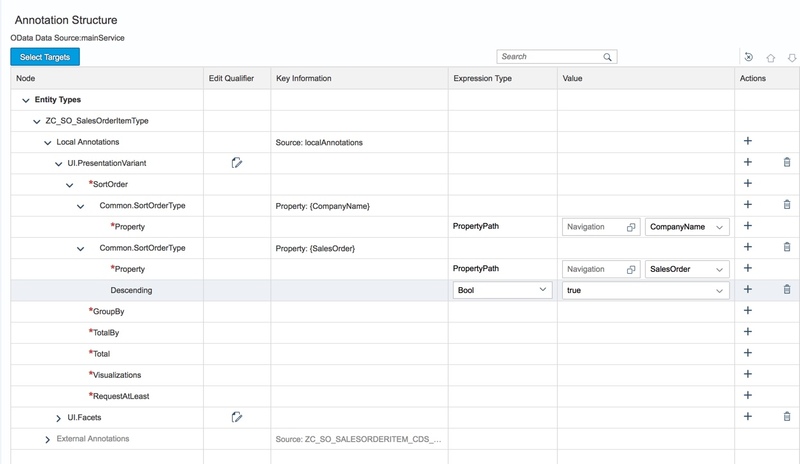 TIP: If necessary you can can override the table type to some extent in the manifest.json by using the gridTable and treeTable settings within sap.ui.generic.app > pages (of the List Report Page) > component > settings. TIP: You can also change the annotations.xml file directly. When you view the annotations file using the Annotation Modeler you can see the being used by the List Report. These annotations were assigned when you created the List Report using the List Report application wizard. In the Annotation Modeler, you can see both the local annotations and the external annotations inherited from the OData Service. TIP: When following the ABAP Programming Model for SAP Fiori, the annotations are created as a metadata extension to the CDS View. And the CDS View has been exposed as an OData Service. You start the process by adding to the Local Annotations. The easiest way to do that is by using the Annotation Modeler and the + icon on the local annotations row. TIP: If you need to change an external annotation, just select the matching redefine icon in the Actions column. So now you are ready to add your annotations. If you want to sort by more than one field, you simply use the sortOrder property to collect multiple sets of sortOrder.by and sortOrder.direction combinations. You can add these using Local Annotations. Start by adding the UI annotation PresentationVariant. TIP: PresentationVariant has a number of subnodes that technically must exist even if they are not used. That’s all the red asterisk indicates in the Annotation Modeler. Within the subnode SortOrder, for each property you want to include in your Sort Order, you add a SortOrderType annotation. The sequence in which you have defined the SortOrderType properties determines the sort sequence. Set the Property of the SortOrderType to the OData entity property you want to sort by. By default Sort is ascending, if you need to you simply add the Descending subnode of SortOrderType. This is a Boolean value and all you need to do is set it to true. 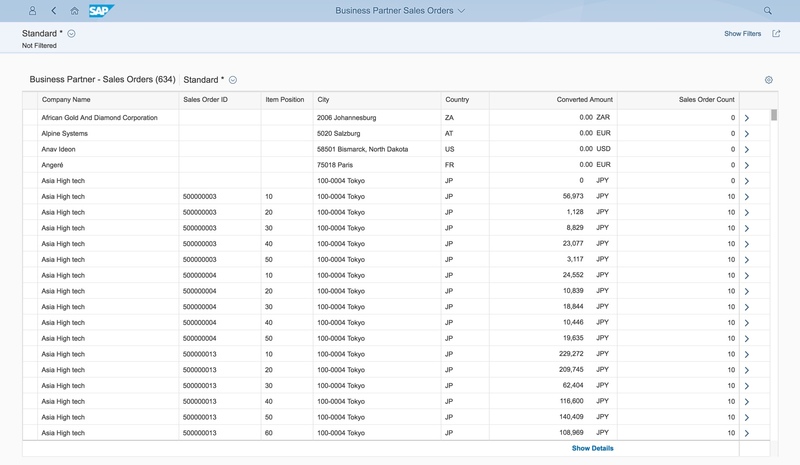 In this example you can see the annotations that will sort the Sales Order list firstly by Company Name and within company by Sales Order ID descending. IMPORTANT: If you forget to do this in local annotations your app may hang! In this example you can see the Visualization and RequestAtLeast subnodes of the Sales Order List Report. 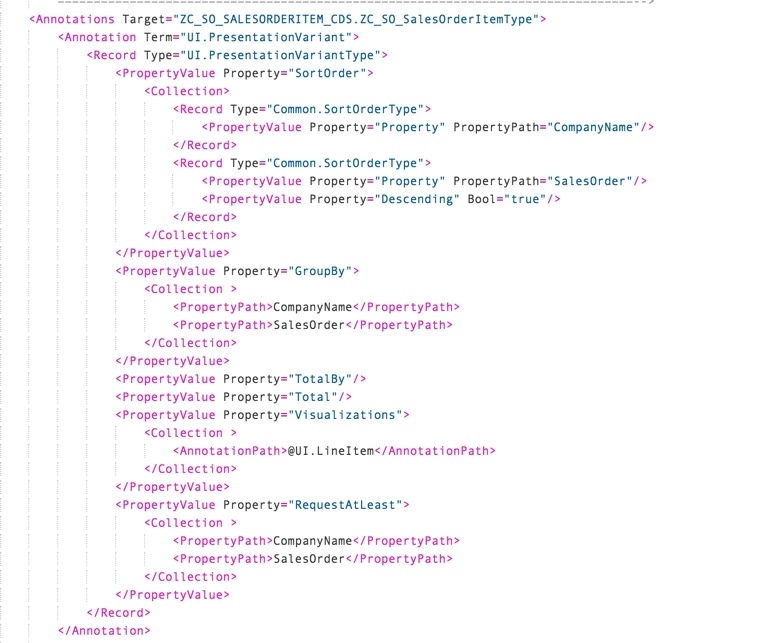 You can find more information on defaulting the Sort Order in the SAPUI5 SDK > Developing Apps with Fiori elements > How to use List Report and Object Page Templates > Preparing UI Annotations > Annotations relevant for List Reports and Object Pages > Tables > Default Sort Order. You can default the grouping by setting the GroupBy subnode of the UI.PresentationVariant. TIP: If you want to group by more than one property, just use the + icon in the Annotation Modeler. VERY IMPORTANT: Remember however that how the grouping is applied depends on the table type. So if you try to apply grouping to a responsive table, the app is will ignore your settings! Provided you make sure you are using an analytical table, then your grouping will work, and your grid table will convert to a tree table. So then your Sales Order List Report will look like this. NOTE: You do not need to sort before grouping – grouping will still work. However like me you will probably find that most business users are likely to expect that the data is sorted within your grouping. If you prefer to code this directly in the annotation XML editor – rather than using the annotation modeler – this is what it should look like. Of course, if you have created a CDS View specifically for this list report, you might prefer to follow recommended best practice and include your annotations as part of your CDS View. The correct way to do this is to add your PresentationVariant and other UI annotations in a metadata extension of your CDS View. Metadata extensions enable you to layer annotations on top of existing CDS Views. As the PresentationVariant applies to the whole report, you add your annotation above the “annotate view” statement as in this example. Lastly you will find a collection of blogs, videos and other material in the Fiori elements wiki. Thanks for this precious information. It will be nice to have the same for the ObjectPage. Is the ObjectPage react the same as the ListReport (in the case where we have sections with table) ? Yes much the same although if you have more than one @UI.Identification or @UI.Lineitem annotation in your report it is always best to use a Qualifier to distinguish between them so that the template always knows which annotation you mean. Are the settings (grouping, sorting, ..) also saved in the (user) Variant? Yes that’s right. Remember that there may be 2 variants – one for the filter and one for the table – or a single combined variant depending on how the list report has been written. It is possible have multi-lines text in a column, to same id row, in the grid table? Thanks Jocelyn for the wonderful Blog! Can we use @UI.presentation variant for value helps based on Modeled Views? Thanks for nice blog .We are trying to add filter on column header same as sort and group but cannot find it in the UI annotation. Can you help here. I am not quite sure what you mean? Do you mean you want to adjust which columns are displayed in the list? That is controlled by the @UI.LineItem annotation. I am getting sort ,freeze in column header but i am not getting filter in column header of table .Could you please help. Please ask questions as a separate post in answers.sap.com not in blog comments. As per the SAP Community Rules of Engagement. I’m using a list report smart template application. On scroll the the UI is sending batch requests again and again to the backend and say if i have 300 records, those 300 records are bound infinite times. Can you please help with a solution for this? HI Akshaya, please raise questions as separate posts in answers.sap.com not as blog comments. At a guess it sounds like your OData Service isn’t supporting top/skip/filter options correctly. Does it work with OData V2 ? Does it work for OData V4 service? Fails to load the metadata file when I try. I have set gridTable:true in my manifest for list report table. But for Navigation to object page, it shows a “Show Details” button instead of Carousel. Can you please help me get a carousel for GridTable ? I think perhaps you mean the > icon rather than a Carousel? The Show Details link shows depending on how your actions are defined. If you have more than one inline action you automatically get Show Details instead of the > icon. Can we have filter,group and sort in smart settings dialog using annotations? I’m not sure what you mean? 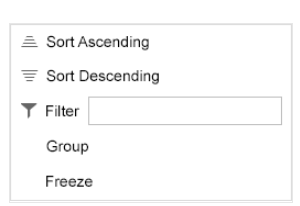 The filter, group and sort settings are automatic in all List Reports – just look for the settings icon on the top RH of the Smart Table. Any defaults you set via annotations will show in the settings as well. nice blog, helped me a lot to get a view behind the scenes. is it possible to skip the navigation on the list. So I just need a list to show a specific status and do not need to navigate. Did not find anything at the annotations which sounded like that. Alternative I will create an second odata, which will show the details, but this would be just for workaraound, because noone need it. 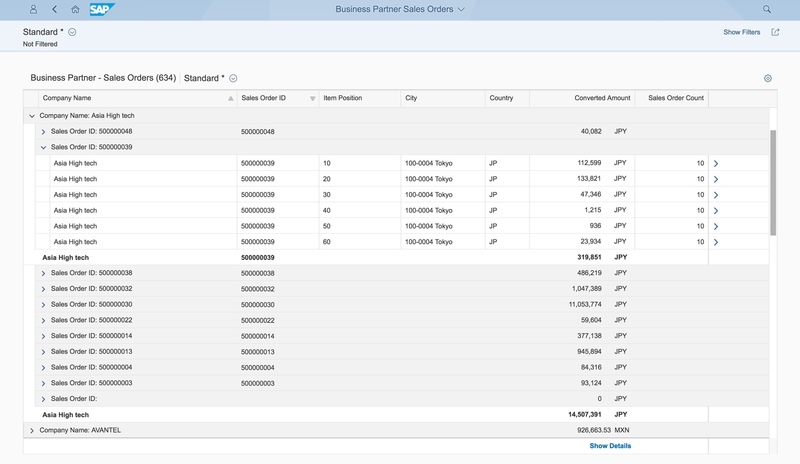 I am trying to override the default navigation to an object page and implement cross application navigation in a standard Fiori list report. I managed to do this using coding in a controller on a custom list report already. Any suggestions on how to achieve this? I have a gridTable report, where I really need totals calculated. This report also has an Association to _line data. I have found that if I add @DefaultAggregation: #SUM to the _parent CDS view, it changes the KEY of that view to GENERATED_ID, which breaks the navigation to _line (due to key mismatch). Do you know of a way to not have the Generated_ID become the key? If not, is there a BADI (or other method) where I can interpret the GENERATED_ID in the _line Select Statment? Interesting… usually we opt for GUIDs as the technical id and then relate that back to a semantic key. You could perhaps use a table function for that? Or else just adjust the on condition of the $projection relationship between the parent and line views. The generated_id, is generated at runtime, and cannot be specified at design time (for whatever reason, I cant post an image of that in this reply). 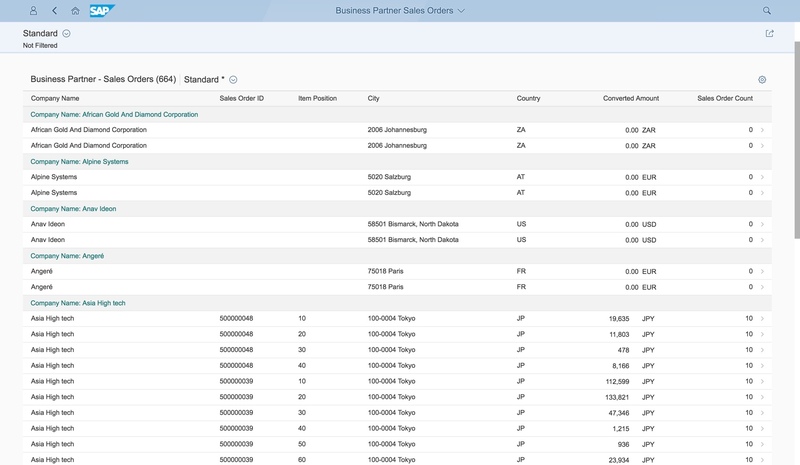 Fiori Elements does not support CDS views with Parameters (I have a separate post on that), and thus no Table Functions can be used in Fiori Elements…. not that it would help anyway, due to #1. So, as it stands, it is impossible to get totals, unless you use an analytical view, and you can’t navigate with an Analytical view…. Is there any other way to get calculated totals on Responsive, or gridTable? I tried local annotations, and it did NOT work. 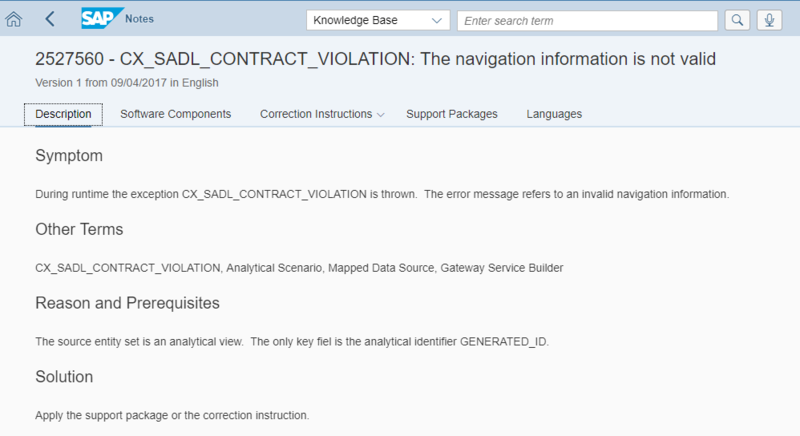 Local annotations only adjust the UI – they can’t make your OData Service provide new functionality. Since the aggregation itself (i.e. the totalling of values) needs to be part of the OData Service it needs to be part of the CDS View itself. This is one of the reasons why it helps to use Metadata extensions rather than put all of your UI annotations inline in your CDS View. Using Metadata extensions helps you clarify, for both your developers and your support people, which annotations are directly influencing the UI, versus which annotations are influencing the capabilities of the OData Service itself. And for what it is worth, this did not work either: @AbapCatalog.preserveKey: true, but it did change SQL view key back to semantic key. Take a look at any SQL View with “Default Aggregation” (using SE11) — you see that all fields are key, but the “Generated_ID” will not be listed. Hi Tim, what I would advise is looking at how this problem is solved in delivered Fiori apps in S/4HANA – if you don’t have one perhaps grab a CAL Fully Activated Appliance to understand what is happening under the covers in a more advanced scenario than can be explained in a blog. My suspicion is that your approach may not be providing what you need because too much is being attempted in the one CDS view. Typically CDS Views are layered into a Virtual Data Model approach. Using those layers gives you the flexibility to combine transactional and analytical approaches. In any case, at this point your questions are too specific to be handled as blog comments. 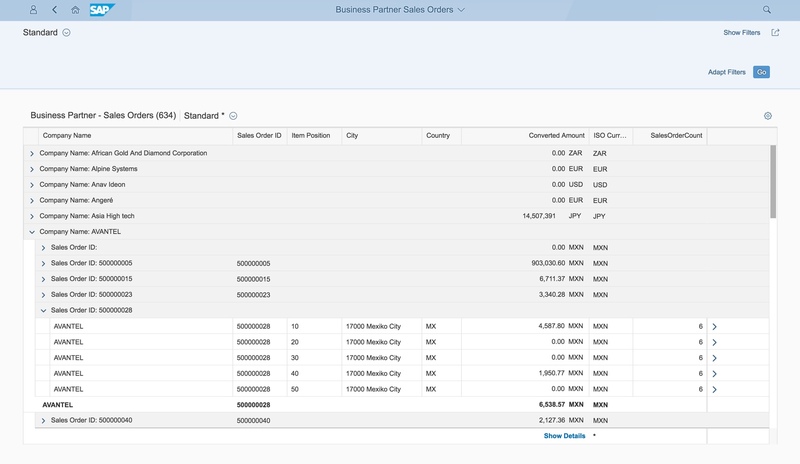 So I recommend creating a separate post with the details of your issue including the backend system release and SAPUI5 release in answers.sap.com. That would also give the opportunity for some of our analytics experts to weigh in, rather than rely on a single blog author. I debugged it, and found enough to search OSS. Unfortunately, I am on 7.50 not 7.52, but looks like this is fixed in 7.52 SP 1. I will request a downport… who knows. I guess it makes sense, as the association were passed as “$projection”. Sorry for adding so many comments to your blog…I need to look at alternative methods of association. Thank you for all of your great posts. Glad you sorted it Tim! And thanks for posting the solution… it’s always the non-obvious ones that are the most frustrating. But as you say it does make sense… with the benefit of hindsight! The SalesdocumentFlowSet content is displayed, but only in a normal Responsive Table and not in a TreeTable. Do you have any hint for me? Is there anywhere a full documentation of sap.ui.generic.app? Ok so your manifest.json looks fine. 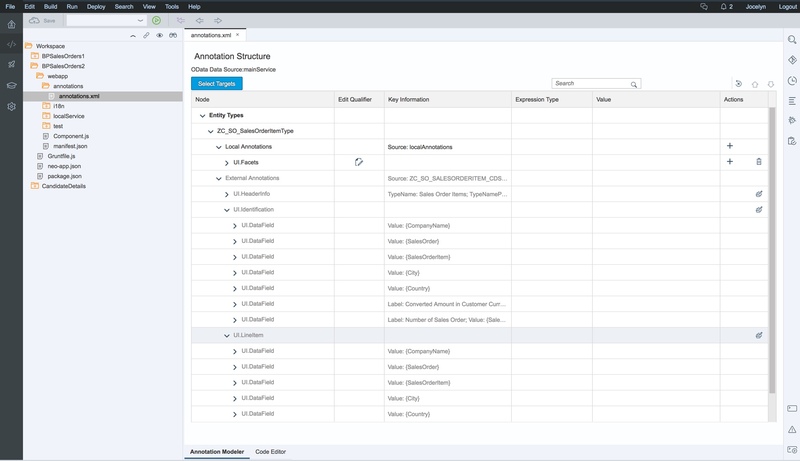 However if the Fiori element is not happy with the hierarchy annotations it will default to a responsive table. Similarly if you render the table on a phone treetable setting will be ignored. This one on how the OData aggregation is interpreted also explains more about the grouping and filtering behaviour that is also related to hierarchy usage. No we do not provide public documentation for sap.ui.generic.app itself nor are their any plans to do so. The template itself is updated very frequently. We do provide documentation for using the annotations. I agree there’s not much publically on the hierarchy annotations themselves. If I find a hint I’ll add some more. Any idea on how to add the sap:hierarchy annotations on calculation views, not on CDS views? Any possibility of adding similar parameters on the frontend (V4 annotations on WebIDE) instead of relying on the odata metadata? I am using a list report with responsive table. Is there any way to merge duplicate via annotations in CDS, If not how to achieve this functionality? Able to merge duplicate via SAP UI5 Visual Editor. By default the list has a Navigation arrow at the end of each line item. Normally in Ui5 I can set list item type to “Inactive ” and the will solve it. but how is this done using Annotation ? The > arrow at the end of each line is the default Expand option. You can remove this by adjusting the configuration to disable the navigation. See the section in the SAPUI5 SDK on Developing Apps using SAP Fiori elements > How to use SAP Fiori elements > Configuring Navigation > Changing Navigation to the Object Page. This is a very informative blog post, thank you. to my Services metadata within the CDS View? This is because the Line-Item keys has to be selected as well; this can be fixed using the RequestAtLeast-Annotation. Well done in sorting it out! By any chance can we set default grouping to 1 field in responsive table? So that user opens the app with group-by set. Like you mentioned, this only works for Grid and analytical table. If I want to customize, any hint on how i can start ? Hi Tejas, Unfortunately grouping is not available at all in responsive tables. It is not supported. Hey, we managed to achieve it with controller extension. Well that’s a new use for extensions I had not thought of! Well done. Worth blogging!